FIBCs (Flexible Intermediate Bulk Containers) also known as Bulk Bags, Tote Bags, Jumbo Bags or Big Bags, and contain between 500kg and 2000kg of anything from aggregates and sand to chemical or food powders. Morray offers a solution to fill most products in most applications with options designed to offer enhanced simplicity of use, reduced environmental contamination and increased output. 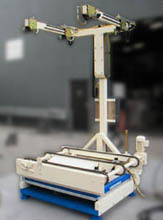 FIBC weigh system complete with weigh platform, electronic display and two loop arms. 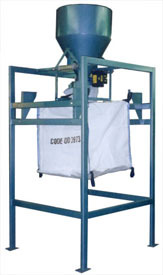 Capable of handling a wide range of 4 loop jumbo bags as a manual or semi automated system. Channel type fingers for easy lift-off with fork truck tines. Can handle loop bags and tunnel bags. This special unit is capable of filling different sizes of bulk bag FIBCs with 4 loop fastening. 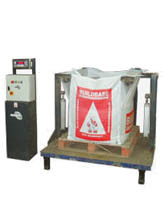 It is incorporated into a semi-automatic system where the bulk bags are hung manually onto the arms, a pallet is indexed into position and the filled bag is then conveyed away on a pallet. Inflatable annulus to seal necked bulk bags to reduce dust. Electronic weigh platform and display. 60 tonnes/hr depending on product. Pneumatic rise and fall column. The Betyne Big Bag Filling Stations are capable of filling large variations in flexible bulk bags with and without inner liners. Manual and fully automated systems are available all are fully dust-proof. During filling the system is dust-tight. Internal or external product inlet assemblies. Manual loading or electrical hoist with transport facility. Flexible outlet to suit any existing system or transfer to into many different Beltyne conveying systems i.e. screw conveyors, disc-lifts, pneumatic conveyors etc. Minimum maintenance for continuous operation.